With Spy themed party formats for all ages, our Super Spies will tailor the difficulty and hiding places to the age of your guests. Perfect for James Bond, Mission Impossible or even a Spy Kids birthday party, your guests will learn sneaky spy moves, learn how to camouflage themselves and stay motionless for hours (well…seconds) just like EJ12 or Zac Powers. Under 7’s Spy Kids Birthday Party– our codes are in visual/picture format, easier for the early readers to decipher. 7+ Spy Master Party– more complex written clues for our savvy team of freshly minted spies. 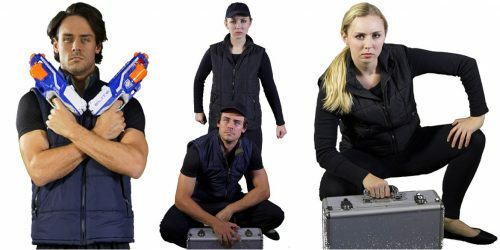 7+ Spy Master NERF War Party– The Spy Master format with extra ‘NERF War Party’ action! We also have loads of Spy Party Game Ideas to help make your party amazing. Read on! Our stealthy Spy Master will appear suddenly in your midst and take your guests on an espionage adventure they won’t forget in a hurry. Kids are quickly drawn into the story of missing treasure, but then they discover that there’s a traitor in their midst (a baddie in a red hat!). They must act quickly to crack the code and solve the case. This party works well both in and outdoors; all you need to provide are a few spots to hide our sneaky clues (brought by the Spy Master) and the treasure, which could be the birthday cake, the Spy themed Gift Bags or even the birthday presents! Our highly trained Spy Master will bring your spy cadets on an exciting journey, with clues waiting to be discovered and decoded throughout the party. Superheroes Inc. knows how to throw a super fun Spy themed birthday party to keep both the body and mind busy. As well as tracking down treasure, the Spy Master keeps the kids active with a series of exciting games designed to hone their spy skills and bring them closer to solving the mystery and finding the prize. If you’re looking for something different, we also have loads of Spy party game ideas to help create a specially tailored Spy party just for you! Please feel free to call us to discuss how we can make your event extra special. Or click through to our FAQ video page with more than 30 Princess, Pirate, and Spy birthday party ideas and videos we can answer all your questions! For more information on our Spy themed birthday parties, check our new Army & Spy Parties website which is dedicated specifically to our Army & Spy Parties for children aged 3-15 years. Book your Spy Kids Birthday Party today! 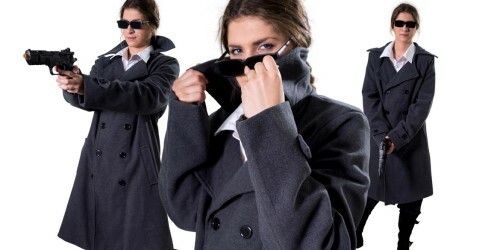 Does a Spy themed kids birthday party sound like just the thing for your special little one? Stop wasting time trying to come up with cool spy party game ideas and call us now on 02 9326 4686. Make a booking for our Spy Master to visit your next Spy themed kids birthday party!